U.S. stock futures drifted lower Tuesday, while global markets pared gains and the dollar eased, as President Donald Trump spoke to the media and detailed his historic meeting with North Korean leader Kim Jong Un after signing a ‘comprehensive’ agreement to continue discussions that would lead to the denuclearization of the Korean peninsula. The two leaders met for around 40 minutes, with only interpreters joining them, in the library of the Capella Hotel on Sentosa island in Singapore before sitting down with a broader collection of officials for a series of meetings, and a working lunch, that included Kim’s sister and confidante, Kim Yo Jong. The pair also walked the grounds of the resort, which once served as a British army barracks, and chatted warmly as they posed for photographs in front of U.S. and North Korean flags. 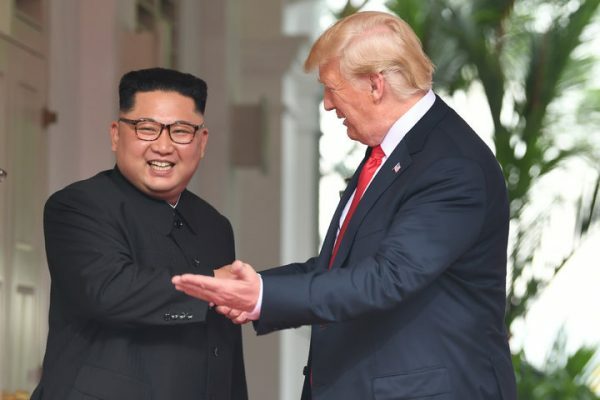 The signing ceremony, however, and the historic importance of the first meeting between a sitting U.S. President and a North Korean leader, was blunted somewhat by the release of the text, which appeared to echo the so-called Panmunjom Declaration from April of this year and included no new actions or commitments on the part of North Korea to put its weapons beyond use. U.S. equity futures point to a modestly softer open for stocks on Wall Street, with investors taking a somewhat cautious tone following the release of the text and ahead of the Federal Reserve’s two-day policy meeting which begins later today in Washington. Futures contracts tied to the Dow Jones Industrial Average suggest a 15.3 point opening bell gain while those tied to the broader S&P 500 suggest a 1.5 point dip to kick of the trading session. The U.S. dollar index, which benchmarks the greenback against a basket of six global currencies, traded at a one-week high of 93.89 during the Asia trading hours while stocks in the region, in the form of the MSCI Asia ex-Japan index, rose 0.11%. South Korea’s KOSPI Composite index, however, drifted modestly into the red following the release of the document text, while Trump’s media appearance pulled it 0.38% lower to 93.53. European stocks also drifted lower following Trump’s presser, with the Stoxx Europe 600 benchmark slipping 0.06% by mid-day in Frankfurt and Germany’s DAX performance index down 0.07%. Britain’s FTSE 100 fell 0.35% by late morning in London as the pound reversed course and rose to 1.3393 ahead of a series of key votes in British parliament that could either bolster or upend Prime Minister Theresa May’s Brexit negotiations. Global oil prices were also on the rise Tuesday, with markets keying on the positive sentiment from today’s Singapore Summit even as data continues to suggest that global supply is starting to accelerate into the summer months thanks to a ramp-up in U.S. and Russian production rates. Brent crude contracts for August delivery, the global benchmark, were marked 29 cents higher from Monday’s New York close and changing hands at $76.75 per barrel while WTI contracts for July, which are more tightly co-related to U.S. gas prices, were seen 15 cents higher at $66.24 per barrel.